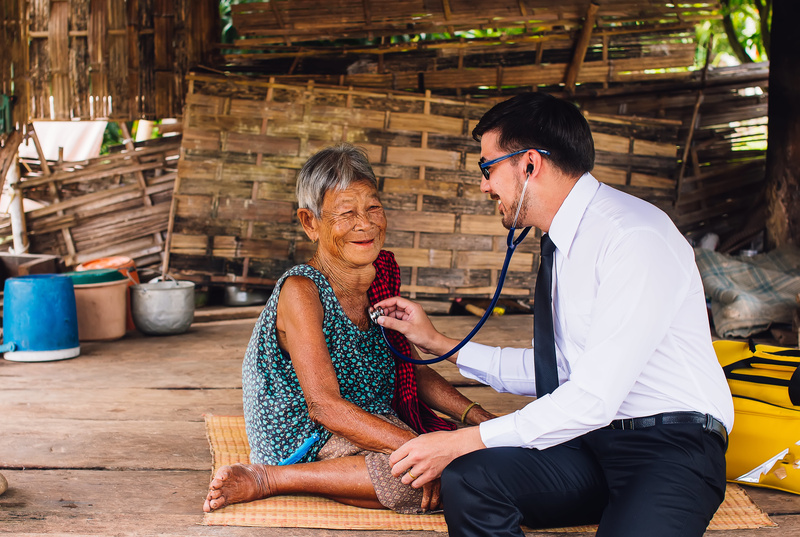 A doctor treats a patient in a remote village. On a recent trip to China, Yiannis Papantonopoulos got a glimpse of the future of medicine—and it was inside a suitcase. The suitcase contained a series of gadgets—including an electrocardiogram (ECG) monitor that can detect anomalies in the heart's electrical signals, a pulse oximeter to detect low blood oxygen sometimes related with heart or lung disease, a blood-glucose monitor to spot abnormal levels of sugar in the blood common with diabetes, an automatic blood pressure monitor and an electronic thermometer. Thanks to that suitcase, one person can easily hold with one hand the electronic diagnostic equipment needed to provide a clinical-quality medical exam, miniaturized and battery-powered, and ready to be carried into rural areas far from the nearest doctor's office. "The clinician can run a set of tests on the spot and process the results right there, so they can immediately prescribe any needed treatment," said Yiannis, a manager at our company who specializes in medical device engineering. "A few years ago that would have been absolutely impossible." Medicine is undergoing a major transformation in the U.S. and around the world. Much of that change is based around the growing availability of wireless, ever-smaller devices capable of monitoring, imaging and diagnosing patients wherever they happen to be. The results are extending health care beyond the doctor's office and hospital, improving the patient experience while making it more accessible and less costly. 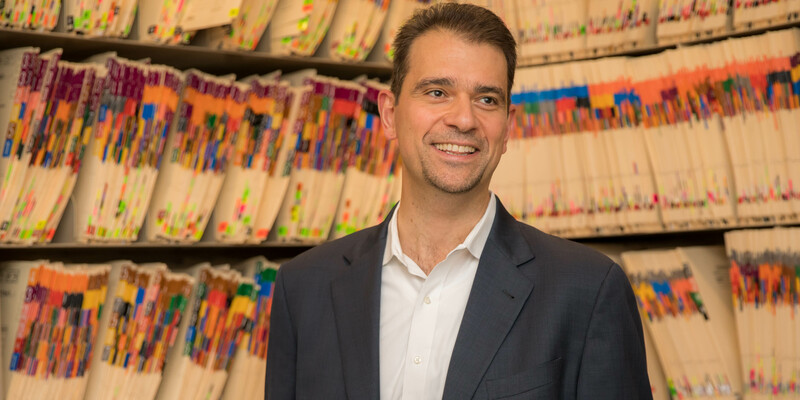 "Physical exams in a clinical setting are still critically important," Yiannis said, "but now we're seeing the capability for health care professionals to continually monitor their patients and extract meaningful information they can act on remotely." Health care based on getting patients to the exam room or hospital bed means care providers have limited visibility into how patients are actually doing in their day-to-day lives. What's making the difference is the rapid increase in access to a range of highly portable health monitors that can track multiple modalities remotely, such as a miniaturized ECG monitor or pulse oximeter, similar to what you'd see in a clinic. "Collecting patient information through remote monitoring is creating a real revolution in medicine," said Christopher Almario, a physician and research scientist at Cedars-Sinai in Los Angeles, Calif., who helps direct the hospital's digital-health efforts. Doctors have begun enlisting wearable or other wireless devices capable of capturing vital signs right in the home on an ongoing basis. By wearing a wrist device the size of a watch that measures heart rhythm, a fully automated blood-pressure monitor or a pulse oximeter, patients avoid the need to stay wired up in a hospital bed, away from family and the other comforts of home. The data can be regularly transmitted to doctors or service providers who can nip a potential health crisis in the bud. "Being able to track patients' hypertension, blood-sugar level and other data is already having a big impact on how we deal with chronic disease," Dr. Almario said. "We're using remote monitoring to try to predict the risk of cardiac events and other acute conditions." It's not just routine health-data monitoring that's extending beyond the hospital and doctor's office. Even some of the most sophisticated imaging and diagnostic tools are becoming available in portable form. As an example, Yiannis points to ultrasound scanners, which have traditionally been cart-mounted in clinics. Now, thanks to component advances that reduce power and size while maintaining signal quality, ultrasound devices are shrinking down to hand-held smart probes that can run on batteries. Carried by first responders in the field or in ambulances, smart probes can produce sharp, real-time images of internal organs, often revealing details critical to immediate treatment. For patients in remote areas of less-developed countries where fully equipped clinics may be few and far between, a smart probe in the hands of a health worker can mean the difference between a healthy and unhealthy birth, or catching a heart attack before it happens. "The lack of accurate but affordable diagnostic tools created a real divide in the availability of good health care," Yiannis said. "But now new technology is making the tools accessible everywhere." Yiannis Papantonopoulos specializes in medical device engineering. If health care outside the hospital continues to advance, medicine will depend on ever-more-capable portable health devices. That's raising the bar increasingly higher on the semiconductor technology behind this equipment. "Data accuracy and resolution are essential," Yiannis said. "The components need to be capable of detecting fine, nuanced signals in the human body, which is a noisy environment." At the same time, the size of these devices needs to keep shrinking—along with their power consumption, given that the tools will often have to rely on batteries. That places enormous requirements on the performance of the components. Meanwhile, health care systems have some of the toughest data-security standards around, which is a real challenge when dealing with vast networks of wireless devices handling patient data outside the clinical environment. The data has to be safeguarded at the highest levels. But Yiannis insists that engineers are up to the challenge, given what's at stake. "This is technology that touches human lives around the world," he said. "This is a goal that everyone can rally around."